Florida International University received a A.
Washington Monthly's ranking of 24 out of 277 of National Universities - Overall Rank was a major contributor to this grade. 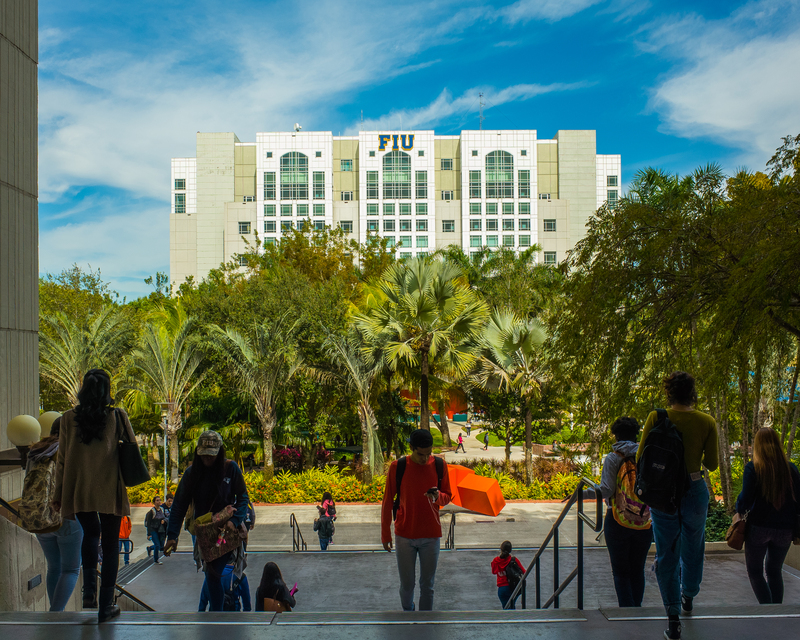 More than 54,000 students attend classes at Florida International University, South Florida's only public research university that has been rated one of the nation's best values in higher education. With top ranked programs in International Business, Marketing, Management, Hospitality and others, FIU is No. 1 in the country in awarding bachelor's and master's degrees<http://www.fiu.edu/academics/degree-programs/index.php> to Hispanic students. At FIU, diversity is key with students representing more than 52 countries. With two main campuses and several branch campuses around South Florida, including in Broward, downtown Miami, and even in China, FIU is just as global, diverse and entrepreneurial as the city we call home: Miami. Under year-round sunny skies and surrounded by a tropical environment, FIU is close to the city's world-renowned attractions, including beautiful beaches, the Everglades, Miami's vibrant nightlife, the Wynwood arts district, and sporting events featuring the Miami Heat, Miami Marlins, Miami Dolphins and the Florida Panthers. Add to that our thrilling campus life with more than 200+ student organizations, university athletics, plus a consistent slate of music, food, and other events, featuring exciting newsmakers and thought leaders. With the university's proximity to the Caribbean and Latin America, FIU offers countless opportunities for internships and careers in business, hospitality, health care, banking, hospitality and more. More than 54,000 students attend classes at Florida International University, South Florida's only public research university that has been rated one of the nation's best values in higher education. With top ranked programs in International Business, Marketing, Management, Hospitality and others, FIU is No. 1 in the country in awarding bachelor's and master's degreeshttp://www.fiu.edu/academics/degree-programs/index.php to Hispanic students. At FIU, diversity is key with students representing more than 52 countries. With two main campuses and several branch campuses around South Florida, including in Broward, downtown Miami, and even in China, FIU is just as global, diverse and entrepreneurial as the city we call home: Miami. Under year-round sunny skies and surrounded by a tropical environment, FIU is close to the city's world-renowned attractions, including beautiful beaches, the Everglades, Miami's vibrant nightlife, the Wynwood arts district, and sporting events featuring the Miami Heat, Miami Marlins, Miami Dolphins and the Florida Panthers. Add to that our thrilling campus life with more than 200+ student organizations, university athletics, plus a consistent slate of music, food, and other events, featuring exciting newsmakers and thought leaders. With the university's proximity to the Caribbean and Latin America, FIU offers countless opportunities for internships and careers in business, hospitality, health care, banking, hospitality and more. Describe the type of student who should not attend Florida International University and explain why. Describe the type of student who should attend Florida International University. Why? What is a typical Florida International University student like? Describe the type of person that should attend Florida International University. Most students are very intelligent, ridiculously friendly and kind. They make you feel at home and are there for you. What are the top 3 reasons someone should attend Florida International University? What was a typical Florida International University student like in high school? Describe the type of person that should attend Florida International University. As Miami's first and only four-year public research university, FIU is worlds ahead in innovation, entrepreneurship, and service to the community. Recently designated a tier-1 research university by the Carnegie Foundation, FIU is also an Ashouka-designated “change maker campus,” joining Brown and Cornell University, among others, as universities that foster social innovation across campus. Our students not only want to make a difference, they are already participating in activities while in college that have a significant impact. With a student body of more than 55,000, FIU offers 180+ bachelor's, master's and doctoral programs in fields such as engineering, international relations and law. Our noted faculty are recognized for not only being leaders in their fields, but truly caring about students. We prepare students for the world-wide marketplace. At FIU, we have the programs and the resources to help you on your path to a sweet paycheck and a career you’ll love. Students have access to JOBlink, an online database that features hundreds of jobs posted year-round. The university builds relationships with Fortune 500 companies and major corporations that recruit on campus. FIU offers career counseling, resume building workshops, and other events designated to groom students for the realties of a career and the professional arena. What are the top 3 things that students do for fun at Florida International University? Join clubs, go to the nature trail, go kayaking for free! There is so much to do. If there is not a club that represents you, you can create it. 53% of students received Pell Grants, which are provided by the U.S. government to students from middle and lower income families. It gives you an idea of a school’s socio-economic diversity. Campus housing is available for undergraduates. Housing deposit : $100.00. Housing deposit is not refunded if student does not enroll.. Freshman allowed to have car. No pets. 7% of students live on-campus. 20% of freshman live on-campus. A program that prepares individuals for the independent professional practice of architecture and to conduct research in various aspects of the field. Includes instruction in architectural design, history, and theory; building structures and environmental systems; project and site planning; construction; professional responsibilities and standards; and related cultural, social, economic, and environmental issues. Plan and design structures, such as private residences, office buildings, theaters, factories, and other structural property. A general program that focuses on the introductory study and appreciation of the visual arts. Includes instruction in art, photography, and other visual communications media. Create or reproduce hand-made objects for sale and exhibition using a variety of techniques, such as welding, weaving, pottery, and needlecraft. Photograph people, landscapes, merchandise, or other subjects, using digital or film cameras and equipment. May develop negatives or use computer software to produce finished images and prints. Includes scientific photographers, aerial photographers, and photojournalists. A program that focuses on the French language and related dialects and creoles. Includes instruction in philology; Metropolitan French; Canadian French; African and Caribbean Creoles; dialects; and applications in business, science/technology, and other settings. A program in the applied visual arts that prepares individuals to apply artistic principles and techniques to the professional planning, designing, equipping, and furnishing of residential and commercial interior spaces. Includes instruction in computer applications, drafting, and graphic techniques; principles of interior lighting, acoustics, systems integration, and color coordination; furniture and furnishings; textiles and their finishing; the history of interior design and period styles; basic structural design; building codes and inspection regulations; and applications to office, hotel, factory, restaurant and housing design. Plan, design, and furnish interiors of residential, commercial, or industrial buildings. Formulate design which is practical, aesthetic, and conducive to intended purposes, such as raising productivity, selling merchandise, or improving life style. May specialize in a particular field, style, or phase of interior design. A program that prepares individuals for the independent professional practice of landscape architecture and research in various aspects of the field. Includes instruction in geology and hydrology; soils, groundcovers, and horticultural elements; project and site planning; landscape design, history, and theory; environmental design; applicable law and regulations; and professional responsibilities and standards. A program that is a structured combination of the arts, biological and physical sciences, social sciences, and humanities, emphasizing breadth of study. Includes instruction in independently designed, individualized, or regular programs. A program that focuses on the Portuguese language and related dialects. Includes instruction in philology; Metropolitan Portuguese; Luso-Brazilian Portuguese; dialects; and applications in business, science/technology, and other settings. A program that generally prepares individuals to plan, manage, and analyze the financial and monetary aspects and performance of business enterprises, banking institutions, or other organizations. Includes instruction in principles of accounting, financial instruments, capital planning, funds acquisition, asset and debt management, budgeting, financial analysis, and investments and portfolio management. Evaluate, authorize, or recommend approval of commercial, real estate, or credit loans. Advise borrowers on financial status and payment methods. Includes mortgage loan officers and agents, collection analysts, loan servicing officers, and loan underwriters. All financial specialists not listed separately. A program that prepares individuals to serve as general managers and directors of hospitality operations on a system-wide basis, including both travel arrangements and promotion and the provision of traveler facilities. Includes instruction in principles of operations in the travel and tourism, hotel and lodging facilities, food services, and recreation facilities industries; hospitality marketing strategies; hospitality planning; management and coordination of franchise and unit operations; business management; accounting and financial management; hospitality transportation and logistics; and hospitality industry policies and regulations. A program that prepares individuals to manage international businesses and/or business operations. Includes instruction in the principles and processes of export sales, trade controls, foreign operations and related problems, monetary issues, international business policy, and applications to doing business in specific countries and markets. A program that generally prepares individuals to provide and manage data systems and related facilities for processing and retrieving internal business information; select systems and train personnel; and respond to external data requests. Includes instruction in cost and accounting information systems, management control systems, personnel information systems, data storage and security, business systems networking, report preparation, computer facilities and equipment operation and maintenance, operator supervision and training, and management information systems policy and planning. A program that generally prepares individuals to undertake and manage the process of developing consumer audiences and moving products from producers to consumers. Includes instruction in buyer behavior and dynamics, principle of marketing research, demand analysis, cost-volume and profit relationships, pricing theory, marketing campaign and strategic planning, market segments, advertising methods, sales operations and management, consumer relations, retailing, and applications to specific products and markets. Plan, direct, or coordinate advertising policies and programs or produce collateral materials, such as posters, contests, coupons, or give-aways, to create extra interest in the purchase of a product or service for a department, an entire organization, or on an account basis. Research market conditions in local, regional, or national areas, or gather information to determine potential sales of a product or service, or create a marketing campaign. May gather information on competitors, prices, sales, and methods of marketing and distribution. A program that prepares individuals to develop, buy, sell, appraise, and manage real estate. Includes instruction in land use development policy, real estate law, real estate marketing procedures, agency management, brokerage, property inspection and appraisal, real estate investing, leased and rental properties, commercial real estate, and property management. Plan, direct, or coordinate the selling, buying, leasing, or governance activities of commercial, industrial, or residential real estate properties. Includes managers of homeowner and condominium associations, rented or leased housing units, buildings, or land (including rights-of-way). Appraise real property and estimate its fair value. May assess taxes in accordance with prescribed schedules. Operate real estate office, or work for commercial real estate firm, overseeing real estate transactions. Other duties usually include selling real estate or renting properties and arranging loans. Rent, buy, or sell property for clients. Perform duties, such as study property listings, interview prospective clients, accompany clients to property site, discuss conditions of sale, and draw up real estate contracts. Includes agents who represent buyer. A program that prepares individuals to manage travel-related enterprises and related convention and/or tour services. Includes instruction in travel agency management, tour arranging and planning, convention and event planning, travel industry operations and procedures, tourism marketing and promotion strategies, travel counseling, travel industry law, international and domestic operations, and travel and tourism policy. A program that prepares individuals to teach art and art appreciation programs at various educational levels. Teach courses pertaining to education, such as counseling, curriculum, guidance, instruction, teacher education, and teaching English as a second language. Includes both teachers primarily engaged in teaching and those who do a combination of teaching and research. Teach students in one or more subjects in public or private schools at the middle, intermediate, or junior high level, which falls between elementary and senior high school as defined by applicable laws and regulations. A program that prepares individuals to teach students ranging in age from infancy through eight years (grade three), depending on the school system or state regulations. Includes preparation to teach all relevant subject matter. Instruct preschool-aged children in activities designed to promote social, physical, and intellectual growth needed for primary school in preschool, day care center, or other child development facility. May be required to hold State certification. Teach elemental natural and social science, personal hygiene, music, art, and literature to kindergarten students. Promote physical, mental, and social development. May be required to hold State certification. A program that prepares individuals to teach students in the elementary grades, which may include kindergarten through grade eight, depending on the school system or state regulations. Includes preparation to teach all elementary education subject matter. Teach students basic academic, social, and other formative skills in public or private schools at the elementary level. A program that prepares individuals to teach English grammar, composition and literature programs at various educational levels. A program that prepares individuals to teach mathematics programs at various educational levels. A program that prepares individuals to teach physical education programs and/or to coach sports at various educational levels. Instruct or coach groups or individuals in the fundamentals of sports. Demonstrate techniques and methods of participation. May evaluate athletes' strengths and weaknesses as possible recruits or to improve the athletes' technique to prepare them for competition. Those required to hold teaching degrees should be reported in the appropriate teaching category. Instruct or coach groups or individuals in exercise activities. Demonstrate techniques and form, observe participants, and explain to them corrective measures necessary to improve their skills. A program that prepares individuals to teach specific social science subjects and programs at various educational levels. A general program that focuses on the design and provision of teaching and other educational services to children or adults with special learning needs or disabilities, and that may prepare individuals to function as special education teachers. Includes instruction in diagnosing learning disabilities, developing individual education plans, teaching and supervising special education students, special education counseling, and applicable laws and policies. Teach preschool school subjects to educationally and physically handicapped students. Includes teachers who specialize and work with audibly and visually handicapped students and those who teach basic academic and life processes skills to the mentally impaired. Teach elementary school subjects to educationally and physically handicapped students. Includes teachers who specialize and work with audibly and visually handicapped students and those who teach basic academic and life processes skills to the mentally impaired. Teach middle school subjects to educationally and physically handicapped students. Includes teachers who specialize and work with audibly and visually handicapped students and those who teach basic academic and life processes skills to the mentally impaired. Teach secondary school subjects to educationally and physically handicapped students. Includes teachers who specialize and work with audibly and visually handicapped students and those who teach basic academic and life processes skills to the mentally impaired. All special education teachers not listed separately. A program that prepares individuals to integrate and apply the principles of the food and nutrition sciences, human behavior, and the biomedical sciences to design and manage effective nutrition programs in a variety of settings. Includes instruction in human nutrition; nutrient metabolism; the role of foods and nutrition in health promotion and disease prevention; planning and directing food service activities; diet and nutrition analysis and planning; supervision of food storage and preparation; client education; and professional standards and regulations. Plan and conduct food service or nutritional programs to assist in the promotion of health and control of disease. May supervise activities of a department providing quantity food services, counsel individuals, or conduct nutritional research. A program that prepares individuals to develop, plan, and manage health care operations and services within health care facilities and across health care systems. Includes instruction in planning, business management, financial management, public relations, human resources management, health care systems operation and management, health care resource allocation and policy making, health law and regulations, and applications to specific types of health care services. A program that focuses on the criminal justice system, its organizational components and processes, and its legal and public policy contexts. Includes instruction in criminal law and policy, police and correctional systems organization, the administration of justice and the judiciary, and public attitudes regarding criminal justice issues. Directly supervise and coordinate activities of correctional officers and jailers. A program that prepares individuals to develop and manage park facilities and other indoor and outdoor recreation and leisure facilities. Includes instruction in supervising support personnel, health and safety standards, public relations, and basic business and marketing principles. A program that prepares individuals to serve as managers in the executive arm of local, state, and federal government and that focuses on the systematic study of executive organization and management. Includes instruction in the roles, development, and principles of public administration; the management of public policy; executive-legislative relations; public budgetary processes and financial management; administrative law; public personnel management; professional ethics; and research methods. Plan, direct, or coordinate operational, administrative, management, and supportive services of a U.S. post office; or coordinate activities of workers engaged in postal and related work in assigned post office. Diagnose and treat mental and emotional disorders, whether cognitive, affective, or behavioral, within the context of marriage and family systems. Apply psychotherapeutic and family systems theories and techniques in the delivery of services to individuals, couples, and families for the purpose of treating such diagnosed nervous and mental disorders. All counselors not listed separately. Provide social services and assistance to improve the social and psychological functioning of children and their families and to maximize the family well-being and the academic functioning of children. May assist parents, arrange adoptions, and find foster homes for abandoned or abused children. In schools, they address such problems as teenage pregnancy, misbehavior, and truancy. May also advise teachers. Provide individuals, families, and groups with the psychosocial support needed to cope with chronic, acute, or terminal illnesses. Services include advising family care givers, providing patient education and counseling, and making referrals for other services. May also provide care and case management or interventions designed to promote health, prevent disease, and address barriers to access to healthcare. Assess and treat individuals with mental, emotional, or substance abuse problems, including abuse of alcohol, tobacco, and/or other drugs. Activities may include individual and group therapy, crisis intervention, case management, client advocacy, prevention, and education. Provide social services to assist in rehabilitation of law offenders in custody or on probation or parole. Make recommendations for actions involving formulation of rehabilitation plan and treatment of offender, including conditional release and education and employment stipulations. Teach courses in social work. Includes both teachers primarily engaged in teaching and those who do a combination of teaching and research. A program that prepares individuals to apply mathematical and scientific principles to the design, development and operational evaluation of biomedical and health systems and products such as integrated biomedical systems, instrumentation, medical information systems, artificial organs and prostheses, and health management and care delivery systems. Apply knowledge of engineering, biology, and biomechanical principles to the design, development, and evaluation of biological and health systems and products, such as artificial organs, prostheses, instrumentation, medical information systems, and health management and care delivery systems. A program that generally prepares individuals to apply mathematical and scientific principles to the design, development and operational evaluation of structural, load-bearing, material moving, transportation, water resource, and material control systems; and environmental safety measures. Perform engineering duties in planning, designing, and overseeing construction and maintenance of building structures, and facilities, such as roads, railroads, airports, bridges, harbors, channels, dams, irrigation projects, pipelines, power plants, and water and sewage systems. A program that generally prepares individuals to apply mathematical and scientific principles to the design, development and operational evaluation of computer hardware and software systems and related equipment and facilities; and the analysis of specific problems of computer applications to various tasks. Research, design, develop, or test computer or computer-related equipment for commercial, industrial, military, or scientific use. May supervise the manufacturing and installation of computer or computer-related equipment and components. A general program that focuses on computing, computer science, and information science and systems. Such programs are undifferentiated as to title and content and are not to be confused with specific programs in computer science, information science, or related support services. Analyze science, engineering, business, and other data processing problems to implement and improve computer systems. Analyze user requirements, procedures, and problems to automate or improve existing systems and review computer system capabilities, workflow, and scheduling limitations. May analyze or recommend commercially available software. A program that prepares individuals to apply basic engineering principles and technical skills in support of engineers, engineering contractors and other professionals engaged in the construction of buildings and related structures. Includes instruction in basic structural engineering principles and construction techniques, building site inspection, site supervision, construction personnel supervision, plan and specification interpretation, supply logistics and procurement, applicable building codes, and report preparation. Apply theory and principles of civil engineering in planning, designing, and overseeing construction and maintenance of structures and facilities under the direction of engineering staff or physical scientists. A program that prepares individuals to apply mathematical and scientific principles to the design, development and operational evaluation of electrical and electronic systems and their components, including electrical power generation systems; and the analysis of problems such as superconductor, wave propagation, energy storage and retrieval, and reception and amplification. Perform engineering duties in designing, constructing, and testing aircraft, missiles, and spacecraft. May conduct basic and applied research to evaluate adaptability of materials and equipment to aircraft design and manufacture. May recommend improvements in testing equipment and techniques. Research, design, develop, or test electronic components and systems for commercial, industrial, military, or scientific use employing knowledge of electronic theory and materials properties. Design electronic circuits and components for use in fields such as telecommunications, aerospace guidance and propulsion control, acoustics, or instruments and controls. A program that prepares individuals to apply mathematical and scientific principles to the design, development and operational evaluation of systems for controlling contained living environments and for monitoring and controlling factors in the external natural environment, including pollution control, waste and hazardous material disposal, health and safety protection, conservation, life support, and requirements for protection of special materials and related work environments. Research, design, plan, or perform engineering duties in the prevention, control, and remediation of environmental hazards using various engineering disciplines. Work may include waste treatment, site remediation, or pollution control technology. Promote worksite or product safety by applying knowledge of industrial processes, mechanics, chemistry, psychology, and industrial health and safety laws. Includes industrial product safety engineers. A program that focuses on the design of technological information systems, including computing systems, as solutions to business and research data and communications support needs. Includes instruction in the principles of computer hardware and software components, algorithms, databases, telecommunications, user tactics, application testing, and human interface design. A program that focuses on the scientific study of the ecology and behavior of microbes, plants, and animals inhabiting oceans, coastal waters, and saltwater wetlands and their interactions with the physical environment. Includes instruction in chemical, physical, and geological oceanography; molecular, cellular, and biochemical studies; marine microbiology; marine botany; ichthyology; mammalogy; marine population dynamics and biodiversity; reproductive biology; studies of specific species, phyla, habitats, and ecosystems; marine paleocology and palentology; and applications to fields such as fisheries science and biotechnology. A program that prepares individuals to apply mathematical and scientific principles to the design, development and operational evaluation of physical systems used in manufacturing and end-product systems used for specific uses, including machine tools, jigs and other manufacturing equipment; stationary power units and appliances; engines; self-propelled vehicles; housings and containers; hydraulic and electric systems for controlling movement; and the integration of computers and remote control with operating systems. Perform engineering duties in planning and designing tools, engines, machines, and other mechanically functioning equipment. Oversee installation, operation, maintenance, and repair of equipment such as centralized heat, gas, water, and steam systems. Analyze statistical data, such as mortality, accident, sickness, disability, and retirement rates and construct probability tables to forecast risk and liability for payment of future benefits. May ascertain insurance rates required and cash reserves necessary to ensure payment of future benefits. A program that prepares individuals to apply mathematical and scientific principles to the design, development and operational evaluation of total systems solutions to a wide variety of engineering problems, including the integration of human, physical, energy, communications, management, and information requirements as needed, and the application of requisite analytical methods to specific situations. A program that focuses on the systematic study of the spatial distribution and interrelationships of people, natural resources, plant and animal life. Includes instruction in historical and political geography, cultural geography, economic and physical geography, regional science, cartographic methods, remote sensing, spatial analysis, and applications to areas such as land-use planning, development studies, and analyses of specific countries, regions, and resources. Study the nature and use of areas of the Earth's surface, relating and interpreting interactions of physical and cultural phenomena. Conduct research on physical aspects of a region, including land forms, climates, soils, plants, and animals, and conduct research on the spatial implications of human activities within a given area, including social characteristics, economic activities, and political organization, as well as researching interdependence between regions at scales ranging from local to global. A program that focuses on the systematic study of international politics and institutions, and the conduct of diplomacy and foreign policy. Includes instruction in international relations theory, foreign policy analysis, international law and organization, the comparative study of specific countries and regions, and the theory and practice of diplomacy. A program that focuses on the scientific, humanistic, and critical study of human communication in a variety of formats, media, and contexts. Includes instruction in the theory and practice of interpersonal, group, organizational, professional, and intercultural communication; speaking and listening; verbal and nonverbal interaction; rhetorical theory and criticism; performance studies; argumentation and persuasion; technologically mediated communication; popular culture; and various contextual applications. Speak or read from scripted materials, such as news reports or commercial messages, on radio or television. May announce artist or title of performance, identify station, or interview guests. Make announcements over public address system at sporting or other public events. May act as master of ceremonies or disc jockey at weddings, parties, clubs, or other gathering places. 80% of students graduated in the top half of their class. 44% of students graduated in the top quarter of their class. 16% of students graduated in the top tenth of their class. The average student pays $12,122 for tuition, fees, and other expenses, after grants and scholarships. Total stated tuition is $4,721, in-state and on-campus, before financial aid. 87% of students receive some form of financial aid. Learn more about financial aid at http://finaid.fiu.edu/. Estimate the net price for you at http://www.collegeportraits.org/fl/fiu/estimator/agree. 20% of students graduated on time. 51% of students graduated in six years. 84% of full time students continued studying at this school after freshman year. The typical (median) early career salary of Florida International University graduates is $40,600, according to Payscale. Florida International University participates in the NCAA Division I-A for college athletics. Want more info about Florida International University? Get free advice from education experts and Noodle community members. ¿Cómo es el proceso para optar por una beca en la carrera de contabilidad? / What is the process to win a scholarship in Accounting? Florida International University offers a number of scholarships which are not program-specific. For more information about the process of applying for these scholarships, visit http://admissions.fiu.edu/costs-and-aid/scholarships/. What is required to do a Simultaneous Translation course? have a minimum of two (2) years of college (60 credits) or equivalent work experience. CaptainU bridges sports and technology by connecting millions of athletes with all the colleges, teams, and events they need to succeed and play at the next level.